At the time Imeraria, who was accompanied by fifteen knights including Sabnak and the same number of guards led by Earl Biron, arrived at a spot from where the border could be seen, the morning sun already guaranteed a clear visibility. Even while inhaling the fresh, chilly morning air within the thickets off the highway, Imeraria dons an expression of dissatisfaction. 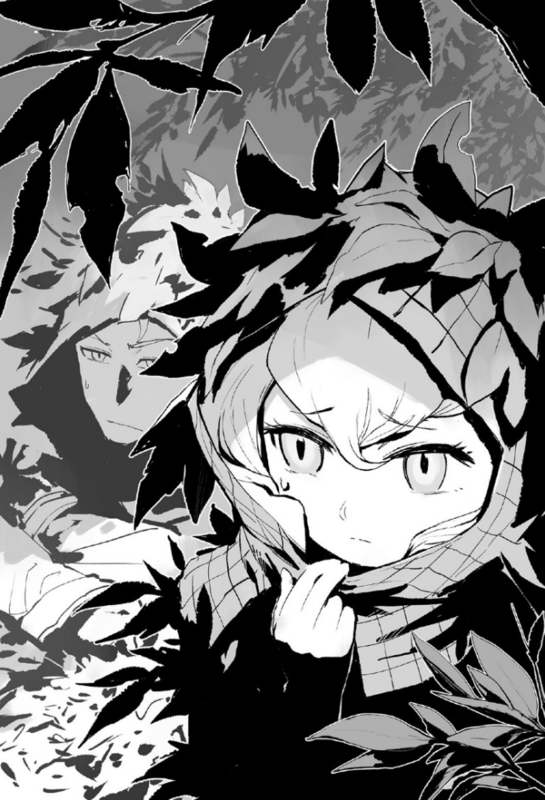 Wrapped up in a cloth that had grass and leaves attached to it, Imeraria, who is facing the front while pinching the cloth with her thin fingers, turned a criticizing look towards Sabnak who is next to her in the same attire. Ahead, where Sabnak pointed at, there were soldiers walking around busily in the vicinity of Orsongrande’s military station and barracks in front of the border and there were also citizens, who were carrying out some task while mingling with the soldiers, visible there. It’s a world where such things such as lenses don’t exist as the civilization is inexperienced in processing glass, but there’s the method of easily looking at a distant place with a plain pipe. Even the one Biron is using was a plain pipe made out of wood, however it was still better than having nothing. Imeraria, who peered into the pipe she was handed, confirms the equipment of the soldiers located in the area of the barracks and judges that there aren’t any magicians. Imeraria ponders while fixedly staring at the border. I wonder what Hifumi would do in such situation? While smiling wryly within her mind, she remembers something she was told before. She hesitated whether to give them the order or not, however, since she understood that she had to do so, she squeezed out her voice by putting strength into her stomach ((persuading herself)) that it was her task to obtain results by moving people. This being a dangerous mission, their lives won’t be guaranteed if they are found. Even so, it’s still better than putting the country at risk. It will be unbearable if I don’t think about it in such way. Biron smiled while showing his white teeth through a gap in the cloth covering him. “Please leave everything to us”, being told that from both sides, Imeraria’s heart became lighter albeit only a bit. Retreating slowly, Sabnak and Biron issue instructions to their respective soldiers. Taking off the cloth used for camouflage that covered her, Imeraria brushed off the grasses which clung to her riding habit. The soldiers exchanged glances due to the question of Imeraria who returned the cloth to a soldier. They apparently didn’t want to believe that Imeraria isn’t aware at all. Even while wavering whether she should be scared or delighted due to Hifumi’s education being thorough beyond her imagination, Imeraria had reached the point of being able to consider it quite calmly. The soldier, who received a direct question from his queen, eagerly recalls the training and lists its contents even while being stiff due to nervousness. Among those there was something that bothers Imeraria. The soldier, who was thanked personally by the queen, retreated holding the cloth, he received, dearly while being ridiculed by his comrades for his stiff, overly ceremonious movements. “Troublesome seeds have been sown”, Imeraria grieved. There was also the notion of asking Hifumi for help in the composed part of her mind, but she wasn’t able to consider that as being correct no matter what. Seeing the figure of the worried Puuse, the one-eared rabbit, Viine, answered frankly. The girls, who left the wastelands after experiencing a number of long days, hesitated how to get in contact in front of the entrance to the highway leading to the city of humans that could be seen at last. The girls didn’t know, but they were right next to a small town located en route the highway and positioned around the half point between Fokalore and Arosel. Due to Gengu scratching his head while say “Well, I give up”, Malfas shakes his head. While teasing her with a “Maidens in love are powerful”, Puuse told Gengu and the others to run away immediately since she herself and Viine will restraint ((the attackers)) with magic if push comes to shove. The guarding soldiers became agitated due to the group of beastmen and elves appearing all of a sudden. Originally it’s a situation where they should call for reinforcements in a hurry, but the soldiers, who ended up forgetting even that due to the overly unexpected circumstances, didn’t do anything but staring at the beastmen who were steadily getting closer. The one who addressed them is Puuse. It was decided for her to talk first as her appearance, except the ears, is the closest to humans. The soldier, who was addressed, gives an answer with an unintentionally excited voice due to her well-featured appearance unique to elves once he sees her from close-by. Puuse, who timidly talks to the soldier, who is taller than her, with upturned eyes, might be regarded as cute ojou-sama from somewhere if met for the first time. Even while the soldier’s heartbeat accelerates with a throbbing sound, he looks at the beastmen waiting behind Puuse. The dog beastman is scary as he seems to be really strong, but the others are a rabbitwoman, who has no more than one ear for some reason, and a tiger beastman, though that one can’t be seen as anything but a child. “It will be a help if you know him”, she says as preface. She doesn’t mention what’s unusual. Once he looks at his colleague next to him after raising his voice, that one’s eyes are likewise opened widely and form a perfect circle. The guard office, they are using, isn’t prepared for something like visitors at all as you can’t say that they are attentive to cleaning by any standard, just like it’s the case with many all-male households. To a certain extent there is a small table and chairs for the sake of listening to the story of the suspicious people they brought in. The soldier, who raised an angry voice, tells Puuse 「Please wait for a minute」 with a frivolous smile and moves to a slightly separate place while pulling an arm of his colleague. Due to the soldiers rising his pinky while saying that, the face of his colleague became pale. Saying that, he dashes away with all his strength and once the soldier delivers the report to the person in charge, even the person, who was informed, stands up unintentionally and isn’t able to do anything, at least in his own position. Or rather, he doesn’t want to make such decision either. His order was already close to being a scream. Hifumi suddenly pondered while killing the bandits. The voice of a bandit, who is lying face down while his wrists are immobilized under Hifumi’s feet, is audible. While hitting the head of another bandit with her iron-ribbed fan, Origa turned a smile towards Hifumi. The bandit, whose shoulder joints were disconnected by the momentum of Hifumi turning around, had his neck stepped on and broken at the time he raised a loud scream. Avoiding the sword swung down by the next bandit, Hifumi hits them lightly with his fist and breaks their nose. The left hand, which the bandit raised to hold his nose, was caught by Hifumi, its wrist was twisted and then broken. Origa’s wind magic severs the head of a bandit, who tried to escape, from behind. Origa slipped a chuckle due to his statement which was completely blind to his own shortcomings in the situation he was currently in. “However, this will change in the future”, Origa killed yet another with wind magic. During that time Hifumi broke the necks of two bandits. With all the bandits besides them dead, the two are standing together in front of the cave which has been made into their hiding place by the bandits. Origa affixes her iron-ribbed fan to her waist and searches the inside for people with magic. Origa, who finished the investigation of the interior, takes the iron-ribbed fan into her hand once again. She didn’t say anything further as both of them understand why those women are within a cave where there’s bandits. Origa follows behind Hifumi, who steadily enters unarmed with his katana affixed to his waist, while preparing her iron-ribbed fan. Origa doesn’t fail to hear Hifumi muttering a single word. Hifumi, who crushed both eyes of a bandit with the thumbs of both his hands in passing, killed him by slapping the bandit’s back of the head against the wall of rock just like that. Two days later Fokalore’s territorial soldiers caught up with an abnormal quickness for the marching speed of an army, but at that time the bandits and ferocious monsters, which were in the vicinity of the city, had been completely disposed of. “If the word was involved by fighting all at once.”? It should be “If the world is involved by fighting all at once”. Damn,Hifumi you crazy.Looks like he’s thinking of starting a world war in isekai. Isn’t it Imeraria Origa is talking about? Why the heck am I imagining that the cause of the world war is Hifumi but for a really different reason…. It’s a lovely slaughterhouse date they’re having. What a savage date they’re having. Spraying blood to the enemy while talking like there’s no tomorrow. In fact if Hifumi die or sealed by Imeraria and her Prime Minister planned to do that. They will be massive effects of his death or absence towards the known world. Those who hated him will cheered and labeled him as devil not a hero and they will try to erased him from history but at the same those who supported him and enjoy the knowledge and convenient methods that provided them by him will defend his glory. There be a time of peace, war and instability happening throughout the ages to come.